After having our 900T Amigo camper (Connie) for the last 14 years (off road for the last 10) we now have the time to work on the restoration. Luckily for a 1978 Fiat she is surprisingly good condition, thanks largely to the Ziebart rustproofing. 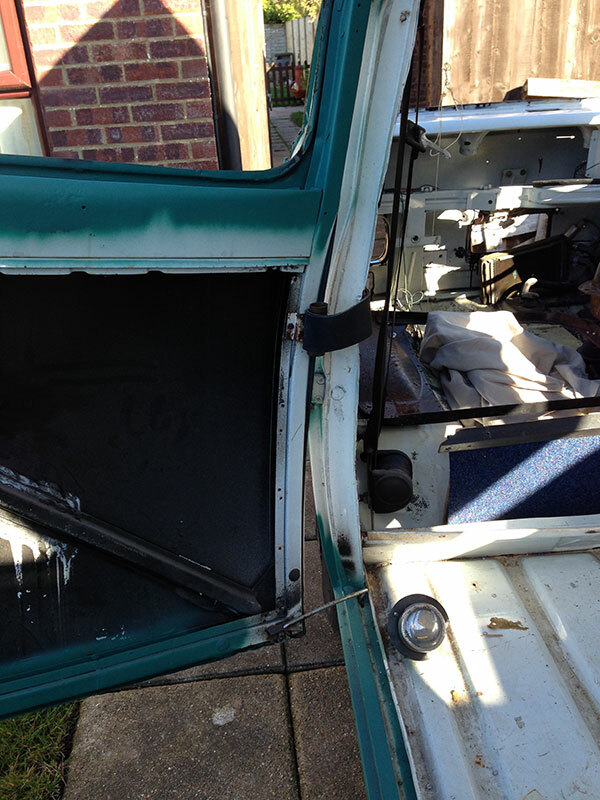 - Interior stripped, salvaged sink & cooker but rest was rotten. - near side sill removed (practically fell off due to previous botched repair - pop-riveted on). - Engine and gearbox out, largely out of necessity as rear wishbones had turned to paper. Local engineering firm laser cut the spring seats and rebuilt the damper mountings - now back on 4 wheels. - Various panels sources many thanks to Ricambio. Will be off to the welders in a couple of weeks to have all the welding done and generally made structurally sound (not much welding really). 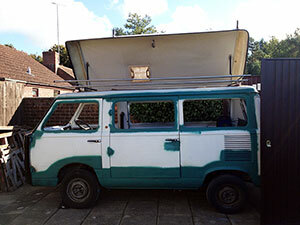 Once back she will be stripped back to bare metal, rust-proofed and resprayed. Not sure what colour yet, probably stick to the original white. I'll add some pic's to chart the progress soon. I've posted a separate thread about how to upgrade the suicide brakes and would appreciate any suggestions. No posts for a while been a bit busy. Welding almost done, should be back home next week. I must admit sending our Amigo to a professional welder was well worth the cost - I could never have achieved what they have done. Anyone around the Bournemouth & Poole area would have to go a long way to find some one as good as Trickett Welding. Not cheap but getting anything done properly never is. Fortunately, I've set up my own website to detail the restoration progress here: fiat900t.co.uk - as much for when I want to get an agreed value on the insurance as anything (and I build websites for a living so nice to have a bit of fun). Fortunately the rust was held at bay by the Ziebart rustproofing so she wasn't in as bad shape as many I've seen. The underside was generally pretty sound. Water & petrol tanks removed to have a thorough check underneath and a few bits e.g. jacking points needed some TLC. All now sealed ready for the tanks to go back in. All in all there is probably more metal now than when she left the Fiat factory. Just the guttering to do now, turned out that a previous repair (before we got her) had been pop-riveted aluminium. Horrible corrosion that just had to come out. Strip everything back to bare metal, rustproof and generally tidy up the lines with a bit of filler - nothing heavy just enough to give a smooth surface for the paint. I'm no good at welding but this I can do. Once prepped it's back to Trickett to take the top off, tidy up the offside gutter (where the roof attaches) and then resprayed. Hopefully by October Connie will be back home and the reassembly will begin! I'll post more in due course. Gary, just had another look at your website. Fantastic workmanship as you say. I have much more than that to achieve but those reference photos have already solved several mysteries. Still using your images for reference. The spare doors I had are being accepted back by the seller in PX as I placed a massive order for panels. So unfortunately I can't strip them for parts. Glad the photos are helping. Probably a bit over the top but I want to make sure that there are no hidden problems that will surface in the near future. The are a few minor dents to fill as well but nothing too problematic. I'll keep posting photo's to my website and will drop a few on here as soon as I get past the usage limits. 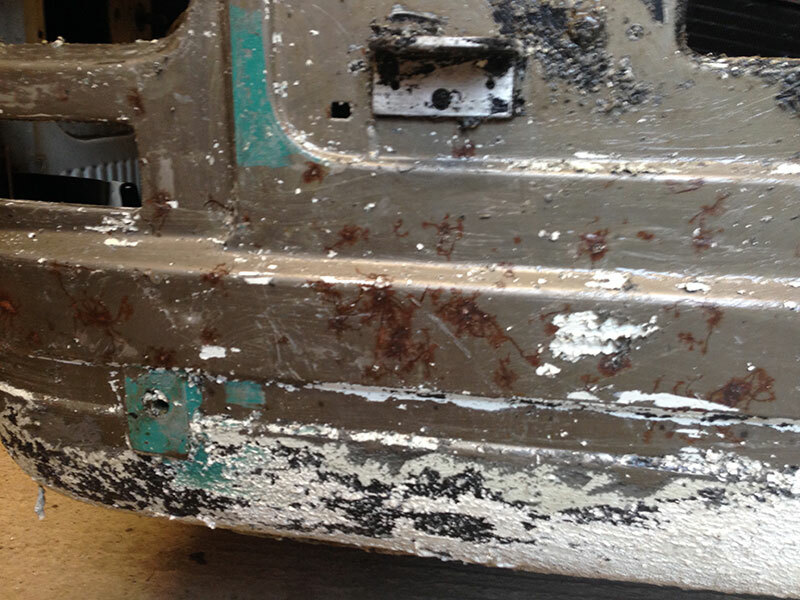 Next job is to strip the paint completely off (Hammerite over Fiat White - nice) down to bare metal and then build back up filling in the odd dent and smooth over the welding where needed. I've ordered the POR 15 system from Frost including the paint stripper. From the research I've done it appears to be the benchmark rustproofing system to use - I'll let you know how I get on with it. I'm particularly interested to see how the POR paint stripper performs. If it delivers what it promises it should make the paint stripping a doddle. Gary, I bought a competitor's POR 15-type paint and I was delighted how well it covered and set smooth and very hard. it was worth the expense and I used it in the wheelarches and all under the new floor of my Fiat 500. Over a year and a lot of miles later and it doesn't have any chips or areas that have peeled. The key thing is prepare well, ie remove all loose stuff and make sure it's degreased and free of what they call "salts". Although it will go over any substrate it is better put on over rough surfaces. 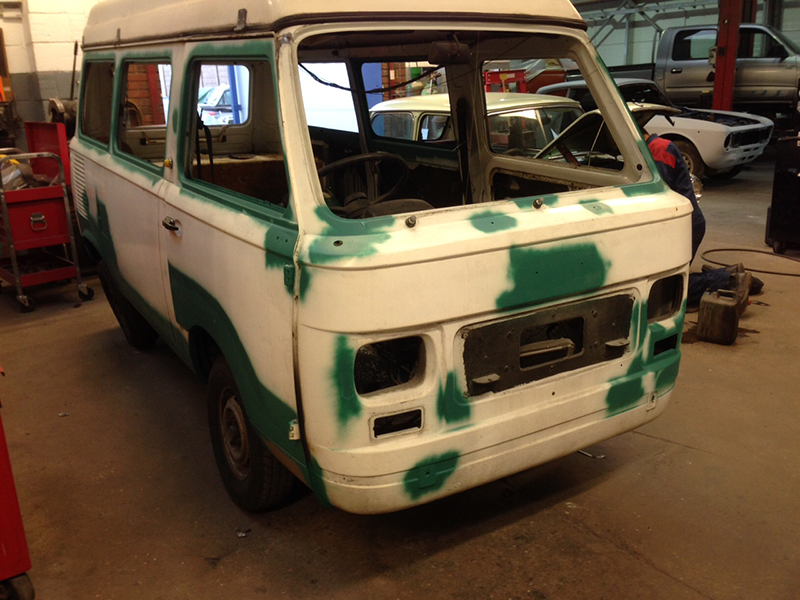 The body & paint work has commenced. Opted to use POR Strip as not as aggressive and as dusty as sanding. Once got the hang of it was very easy and takes the old paint off (including a top coat of hammerite) very easily. Taking the paint off back to bare metal was the best choice in the end... just look at all the rust that was hidden under the paint! Having just had the back of my legs whacked for the umpteenth time I'm taking a slight detour here. The side door stay on Connie is little more than a wire coat hanger - see picture. This is how she came when we bought her years ago but if we are to use her later I need to come up with a better method of holding the door open - especially as our 8 year old will be onboard (trips to casualty with trapped fingers are highly likely as the door is now). Has any other 850T/900T/E owners got a better solution that they could include a photo of here? I have a couple of ideas myself but if someone already has a working (and safe) one I'd be more than happy to use it and give credit where its due. Compared to many others Connie's 'pop-top' is barely wider than the van. Roof accommodation is provided by two hammocks - big enough for a couple of youngsters but not adults. More flexible sleeping arrangements could be in order! I think your resto is coming on great!! I have had my Pandora for two years now, and has been very much a running restoration as I vowed it wasn't getting laid up (the fate too many of my projects have met!). it is great fun to use tho and always turns heads. keep up your good work! 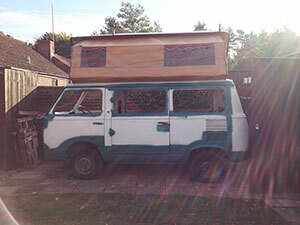 Gary, the top of my van is a different design...more sophisticated, if I may say so . But where exactly did you start when removing it.? Did you have rooflining to take out. I was just looking at the Blog and I envy the stage you have reached with the bodywork. Have you tried sanding that POR? I think it's going to be a struggle. I didn't realise you were using it on the body as I think it's usually used on the underside. It is good stuff though and I guess it will have the same long term benefits of the epoxy primer that I will be using. Last edited by fiat500; 21-11-2015 at 11:17. The pop-top on Connie is probably one of the simpler variants around. Removal is straight forward, I've already removed the canvas (as you can see on the website). Starting from the bottom I drilled out all the pop-rivets holding the 'grip' strips in place first and made sure that the canvas was free from the body. Then simply unscrewed the fixings from the pop-up 'tub' - removing the ends first, then the section attached to the hinged side of the top and finally the outer edge. The only mildly tricky bit is holding the roof up will you unfasten the roof struts to feed the canvas through - my head was used as support for the 5 minutes it took (one end at a time). The top is secured by three hinges and some serious pop-rivets. The removal of the top simply requires these drilling out and then lift the top off - a couple of tall people or a gantry would help here. NOTE: I'm leaving this job to the welders when she goes back to them in the New Year - the guttering needs welding up where the hinges attach. The roof lining (looks like canvas pegboard) can be left in place - on Connie it appears to be glued in any case. You will need to take care when living the top off so you don't catch it and damage it through. My canvas top has a few holes in it and leaks so I will be replacing it with modern 'canvas'. This will remove some of the bulk which will make it easier to pack away. While I'm at it I'm considering re-working the top to make more space for sleeping - but there are plenty more jobs to worry about before that. PS. I wish I had you welding skills - it would have saved me a fortune! The instructions with the POR15 state that it's a pig to sand and I can agree with that. The POR15 is self-leveling but you do need to be sparing when you paint it on to ensure that you don't get any runs - reading all the notes using a brush appears to be the best way. This is more down to the fact that if you spray it you have a high chance of wrecking your spray gun. Most likely I'll remove it completely and start again - the good news is that the POR stripper that I've been using to remove the old paint works well on the POR15 paint as well. POR15 is generally thought of as for use underneath or in out of the way areas. However, it also has a sister product called 'self etching primer' designed specifically for use over the top of POR15. I wil be doing all of the above bar the top coat, this will be in a proper spray shop where there is no risk of dust blowing all over it. Last edited by Gary50; 22-11-2015 at 09:34.